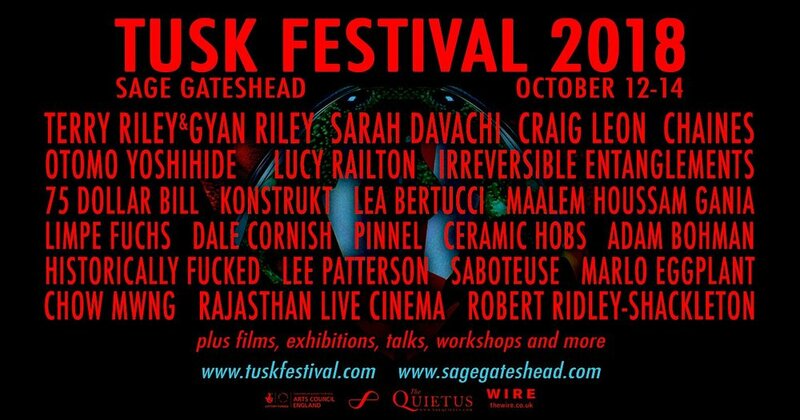 TUSK Festival returns for its 8th edition this October, once again bringing its uniquely diverse programme of adventurous international music to the North East of England. Continuing its partnership with Sage Gateshead, TUSK again makes full use of the landmark building, its flexible public spaces and truly high-end production values to showcase a TUSK 2018 line-up that is as unwavering as ever. Once more, alongside a truly eclectic and international music menu and TUSK’s trademark slew of UK debuts, festival-goers can again enjoy the festival’s renowned film programme, exhibitions, talks, installations, interactions and more. Many more acts still to be announced, plus films, talks and more and after hours actions and exhibitions at The Old Police House and Workplace Gallery. Tickets go on sale 10am Friday 9 th March. 50 early Birds are £60, then full weekend tickets are £70. Day tickets will go on sale later in the year and tickets just to see Terry Riley & Gyan Riley in Hall One on Sunday 14th October will also be available. For more details and further announcements, visit sagegateshead.com, tuskfestival.com or call the Ticket Office on 0191 443 4661.